A comical fruit bat addresses readers about its beloved cherries, not guessing they will soon disappear. From the simple, funny cover to the final, wordless page, this book is a quirky gem. The art has the appearance of simple woodblock prints. The black-winged, gray-bodied bat has thin, pointy, white teeth that issue alternately from a pencil-thin smile or a grimace and little black eyes with thin, expressive, black eyebrows. 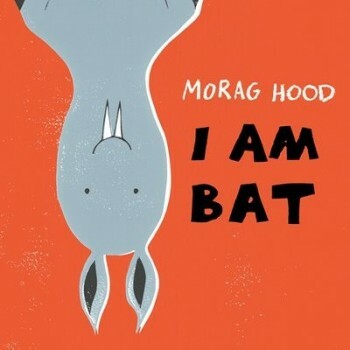 Its first words, as it hangs upside-down against an avocado green background, are: "I AM BAT. I do not like mornings." On the opposite page, against solid yellow, it smiles, its wings full of red orbs with green stems, and says, "I like CHERRIES." It goes on to describe its love of cherries, and then, with a Dracula-like sweep of wings, it warns readers that no one should take its cherries. There follow several pages of humorous, fruit-bat bravado. Although there is no gender ascribed to Bat, many caregivers will feel an urge to read it in imitation of the legendary Bela Lugosi. As cherries disappear, readers see subtle evidence of which animals are taking them. Bat's proclamation of eternal unhappiness is quickly reversed by a thief-engineered fruit replacement. Old and young alike will have to giggle at the bat's show of speedy adaptability. HB. 32PP, By Morag Hood, 2017.